Need a followup to your Christmas family services? An affirming Christmas gift for Messy Churches to give to their Messy families to use at home over the Christmas holiday period. This minibook aims to transfer the core values of Messy Church to the home and family context, encouraging families to talk together, be creative, be hospitable, be Christ-centred and celebratory, and including activities for all ages. 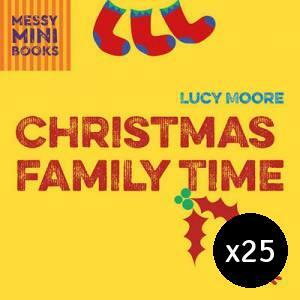 Christmas Family Time - Pack of 25 by Lucy Moore was published by Eden bundles in September 2016 and is our 15379th best seller. The ISBN for Christmas Family Time - Pack of 25 is EDENBUNDLE-1755. Be the first to review Christmas Family Time - Pack of 25! Got a question? No problem! Just click here to ask us about Christmas Family Time - Pack of 25.